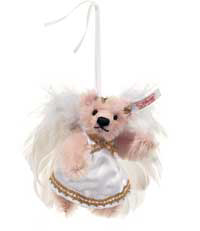 Beside the regular Steiff collection we have many other Steiff collectors items. We also store the regular Steiff items. When you are interested in something not shown, just give us a call or a fax and we will let you know the price and when we can deliver the item to you. Shipping Netherlands € 5,00 or free when your total order is € 50,00 or above. Shipping in European community: € 10,00 or free when your total order is € 100,00 or above. Feel free to combine your order, to save on shipping. 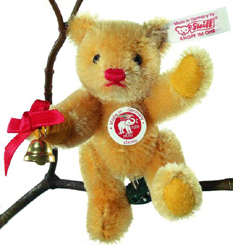 This bear is made in 2004 in a limited edition of 5.000 pieces. She is 10 cm. / 4” tall. 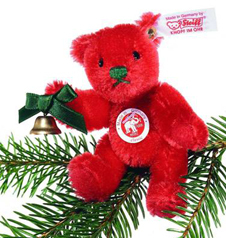 This ornament is made by Steiff in 2006. 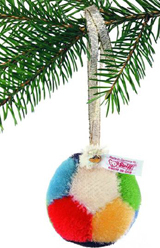 It has a pin on the bottom, so you can put the bear everywhere in the tree. The bear is 9 cm. / 3.6" tall and limited to 2006 pieces. 6 cm. / 2.4” tall.